MeeGo still needs a lot of love in the repository business, or in plain words: how to get more programs to your MeeGo device. Things like the universe/multiverse of ubuntu or the “extras-devel/extras” of maemo: People package new software, put it there and everybody else can download it. If I understand correctly what OBS does, it should be fairly easy. Create your OBS “area”, upload your package, try to build it against the different MeeGo versions and when it is ready publish the URL of your repository with the result [This is not trivial. Is it possible at all?]. Once the things are properly tested, promote that package to a common well-know repository and we all are happy. Other interesting software like Transmission is in the official repos, and MeeGo is a plain linux inside, so the official sopcast client for linux works just following their instructions. More sources for packages are welcome as comments. Hope this helped. Hello planet GNOME, glad to be in this planet after so many years reading it. Probably you were able to skip my Tracker presentations in different conferences… so now I try via blog. And my first post brings good news. This is a synchronous query to the store. Note that you have a cursor to access the results: they will be retrieved from the DB only when needed. Using this while building a model for the UI should show quite a performance improvement compared with the old DBus API. And if you fancy more the asynchronous way of coding, the code looks like this. You can open the connection, run the query and retrieve the results all asynchronously. When it comes to miners (processes retrieving information), here is a skeleton of an implementation: a subclass of Miner overriding few methods. Install with the usual dbus files and you have a miner that can be started/stoped/monitored with the Tracker tools. libtracker-sparql is our recommended way to use tracker, the DBus API can be considered internal, and now with gobject-introspection it is available from different languages than C or vala. Combine this with libpeas (also using GI) and then we can easily write plugins showing information from Tracker into applications like EOG or totem… Interesting! Better later than never. Today i promoted Mussorgsky to extras-testing. Now it needs some thumbs up from the power users to get into the famous extras repo, reaching a wider audience. If you have used it, and think it passes the Q&A checklist, please give mussorgky some karma! A couple of weeks ago, we updated Tracker to load its configuration using GSettings instead of its own old-fashioned .cfg files. GSettings is an API to manipulate key=value pairs that abstracts the backend (keyfiles, gconf, dconf…) where they are actually stored. This was a good change in a lot of senses, but it was breaking our functional tests. We have a suite of tests that we like to run once Tracker is installed in the system. They check if the basic functionality is working fine: the store starts, the miner starts, basic Sparql is processed fine, crawling/monitoring a directory is ok… Some of those tests rely on booting tracker with an specific configuration and with gsettings that isn’t as easy as defining a new XDG_CONFIG_DIR anymore. Well, lets fix the tests then. My first idea was to hack our GSettings object to load data from the system or from a keyfile, depending on an environment variable: very portable, but is an ugly hack and the code paths start to differ a lot. Then i discovered the DConf profiles. Only works when gsettings is using dconf and needs to install a system-wide profile, but otherwise (in code and test setup) is nice. If at the same time you are changing the dconf schemas, make sure to remove old files from /usr/share/glib-2.0/schemas, run /usr/bin/glib-compile-schemas /usr/share/glib-2.0/schemas and remove any old dconf database (in ~/.config/dconf) including “user”. Otherwise if some code is using the old schema, it won’t complain but the values will be wrong. DConf uses the GVariant serialization, so be careful when setting lists. I hope this saves some time to the next person trying to test something that uses dconf for its settings. I guess neither Tomboy nor Tracker need much introduction. If you have both of them on your computer, you have probably wondered “why Tracker doesn’t index my Tomboy notes?”. Good point. You are not the only one thinking that; somebody even opened a bug about it and here comes a solution. It is a plugin for Tomboy (a NoteAddin in their terminology) that writes the information of the note into Tracker making it searchable on the desktop (E.G. using tracker-needle). The code is available in gitorious. Checkout, compile and install (you can use make install-data-local in src/ to install it on your $HOME). Well, you also need the latest tracker from GIT until we release 0.10.2 (soon) because i needed to add a “Note” class there. The current status is “It works on my computer” but is safe to try because this plugin only exports data and never touches the original notes, so there is no risk of losing any information. Feedback is very welcome! Time flies, code flows and a new stable release of Tracker is here. Already 0.10, and a lot of improvements everywhere. Maybe another day i can write about the internals, but the big news for the developers using (or eager to use) tracker is libtracker-sparql. libtracker-sparql is our client library to query/update data in Tracker. GObject-oriented, written in vala, easy and straight-forward: open a connection, run a query, retrieve the results. Look how easy the example looks. Under the hood a lot of things happen. It allows sync and async queries. Also it chooses the best method to talk with tracker, depending on your versions of dbus and sqlite. Both libraries got new features and we use all of them: if your dbus is recent enough tracker will try to use the “fd-passing” feature (the processes only exchange a file descriptor to read from, instead of a huge string), and if your sqlite is recent enough it has WAL (the new journaling system) and your process will open the database directly (only for reading), no more dbus to transfer results!! All this technicalities improve a lot the performance (less or better dbus usage) but thanks to WAL we can offer a very valuable new feature: cursors. If the application is reading directly from the DB, the results will be loaded when needed. This wasn’t possible in a dbus-based API where the client needed either to retrieve everything (very slow) or simulate cursors with LIMIT and OFFSET. libtracker-sparql is convenient enough to start using it in different programs. The next obvious steps are to enable the gobject-introspection, and to build a live model on top of it. In the Q-World it is done, so definitely is possible. 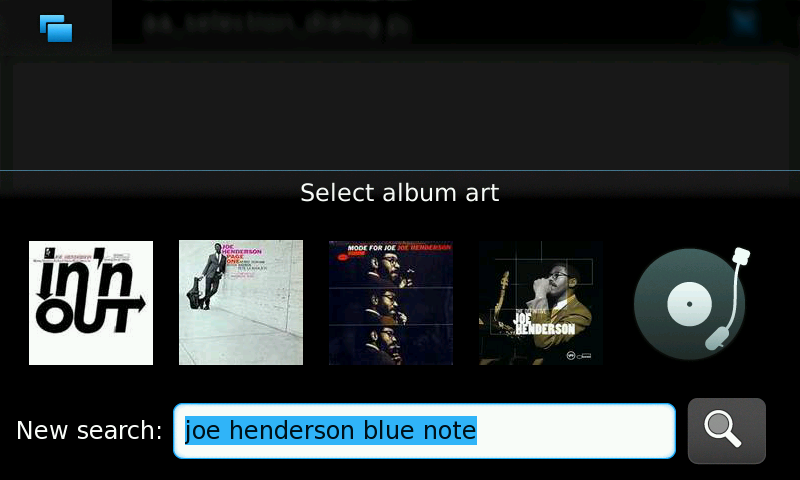 Here comes a new version of Mussorgsky, the metadata editor and album art downloader for maemo. Support for WMA, OGG and FLAC (the merits go to mutagen). Enjoy and as usual, feedback is welcome. We have a bugzilla component (under Extras/Mussorgsky) to report issues. By the way, If you have a project in python and wonder how to add i18n, give a change to this wiki page: how to internationalize python apps in maemo; i tried to write there as clearly and simple as possible how to do it. Albums with special characters in their name (like ‘&’) are now handled correctly. It is already available in extras-devel, hope you enjoy it. And finally, thanks to Eric, Aapo and Claudio for their very valuable comments and help!